We all knew this day would come. 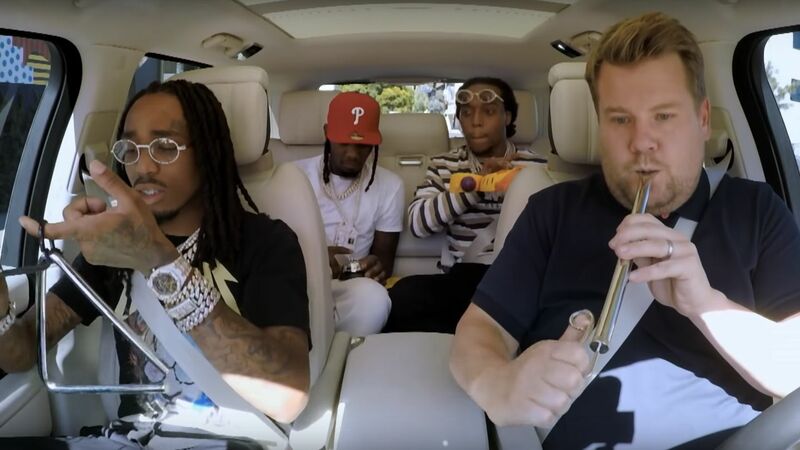 Deep down, in the dark recesses of our minds, maybe as we were just about to fall asleep, we pictured James Corden inviting Migos — by all accounts, one of the hugest pop acts on the planet — into his SUV for “Carpool Karaoke” and singing along to every word. Now that day is here. There’s a lot of dabbing. In the segment that aired Tuesday night (November 13), Quavo, Offset, and Takeoff pile into the car for ad-lib-heavy renditions of massive Migos cuts like “Walk It Like I Talk It” and “Bad and Boujee.” Corden mercifully leans into how corny he is, and the trio correctly help him understand what dabbing originally was and where it comes from. They also launch into some vintage Whitney Houston. Then it gets wild. Inspired by the $200,000 cash Offset’s lugging around with him, all four pop off the highway into a high-end clothing shop to upgrade Corden’s wardrobe. The results are predictably ridiculous, but probably not any more absurd than when they hop back into the SUV and experiment a bit with a small symphony of noisemakers. Quavo’s on the triangle, Takeoff mans the children’s keyboard, and Offset works the lobby bell. Does it play? Quavo’s answer is a resounding, bellowing “hell no!” It could power factories. I won’t ruin the big reveal, but it ends with all four unexpectedly cranking out a particular song beloved by folks with Fenway Park season tickets. Migos, meanwhile, have had yet another prolific year. After Culture II dropped at the top of 2018 (and subsequently hit No. 1), both Quavo and Takeoff have released their own solo albums as well. And Culture III is reportedly not too far away, either. In the meantime, watch the full clip above.